Put your feet up and fall asleep in this gorgeous Ohuhu Nylon Fabric Hammock! Great to lounge in and enjoy a spot of quiet time, this hanging hammock will help you relax at the end of a busy day. This hammock is crafted with 100% high strength breathable nylon fabric with a weight capacity of up to 600 lbs! Attractive design with its strong features, it is ideal for camping, yachts, verandas, pergolas, gardens, outdoor decks and just about anywhere your heart desires – even better if there is a view to enjoy whilst in the hammock! This durable quality hammock would make the perfect gift for anyone. 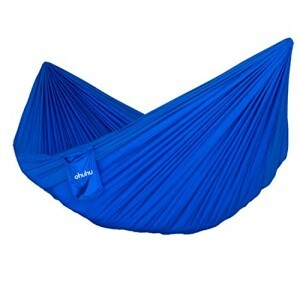 Experience the bliss of a full body relaxation with this Ohuhu Nylon Fabric Hammock today!